A couple of weeks ago, one of the ladies in my Fit Pregnancy groups mentioned she had egg salad for lunch. Ever since I have been craving a yummy egg salad. For pregnancy reason I need it to be fresh because it contains mayo. And bad mayo and pregnancy. NO BUENO! 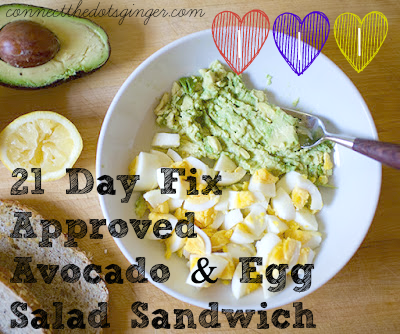 Check out this awesome egg salad without mayo. Using an avocado as the "glue" that holds the sandwich together instead of the mayo. Plus you are getting a healthy fat so, WIN WIN! 1. Combine eggs, avocado, lemon juice, and salt in a medium bowl; mix well.2. Spread ¼ of egg mixture onto each slice of toast. 3. Top evenly with watercress. 4. Sprinkle Fresh cracked pepper and paprika to taste on top. Serve with a side of fruit, and some carrots and sliced bell peppers. Place 8 eggs in the large saucepan. Cover eggs with water, about 2 inches above. Once at a boil, cover and turn off heat. Set timer for 10-12 minutes. Drain hot water and cover with very cold water right away. (I use water and throw in some ice to stop the cooking process). Let sit until the eggs chill enough to handle. Peel and they will be perfectly done, every time!